Dr Ian Macreadie is a highly regarded Australian researcher in the fields of molecular biology and microbiology. Author of more than 60 research papers, he is a Principal Research Scientist at the Biomolecular Research Institute of Australia’s Commonwealth Scientific and Industrial Research Organisation (CSIRO), and national secretary of the Australian Society for Biochemistry and Molecular Biology. In 1997 he was part of a team which won the CSIRO’s top prize, the Chairman’s Medal. 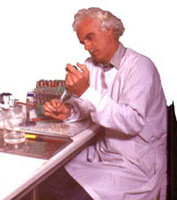 In 1995 he won the Australian Society for Microbiology’s top award, for outstanding contributions to research. He is also adjunct professor of the Royal Melbourne Institute of Technology.